This Cucumber Avocado Salad is made with two main ingredients: cucumber and avocado. 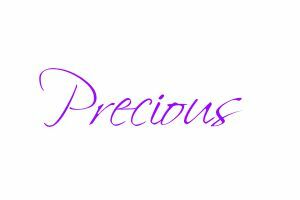 It is so simple, yet so elegant. So easy to make yet it tastes like you put in a lot of effort. 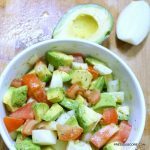 Once you try this easy Cucumber Avocado Salad, it will become a regular at your home, I guarantee you. 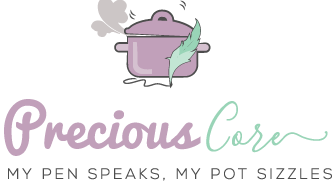 But then, isn’t this one of those reasons why Precious Kitchen exists? I’m here to show you both recipes that you can make in a couple of hours and those that you can make in a couple of minutes. 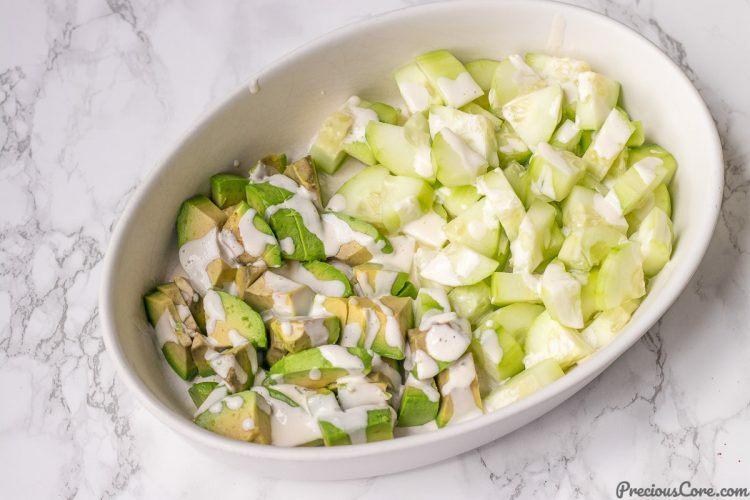 This Cucumber Avocado salad is ready in a couple of minutes! You need two main ingredients: cucumber and avocado. 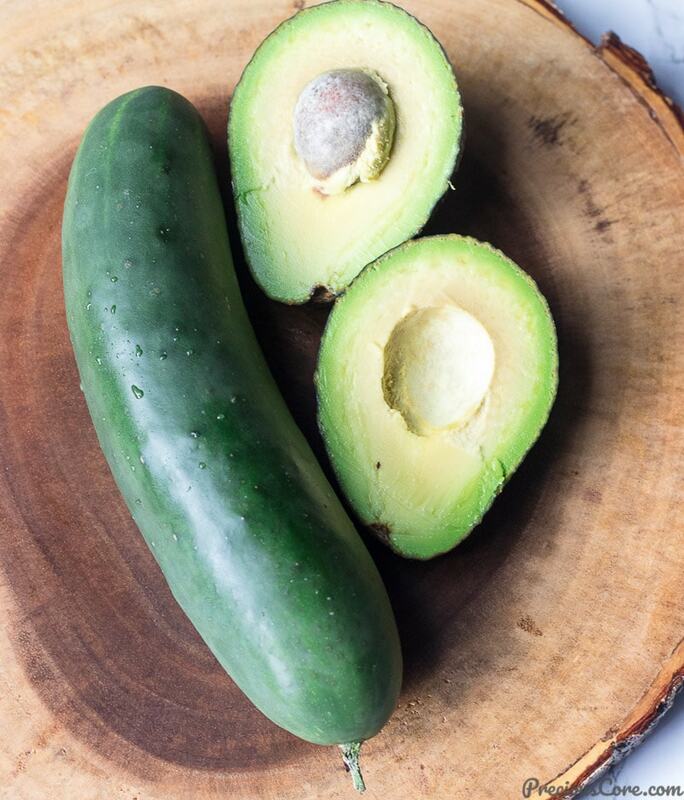 All you need to do is peel, chop your cucumber and avocado and place in a bowl. Now, I had to peel the cucumber because I used regular cucumber whose skin is quite thick. I used a potato peeler to get a nice thin peel. However if you use English cucumbers with light crispy skin, then no need to peel. Just chop them up. 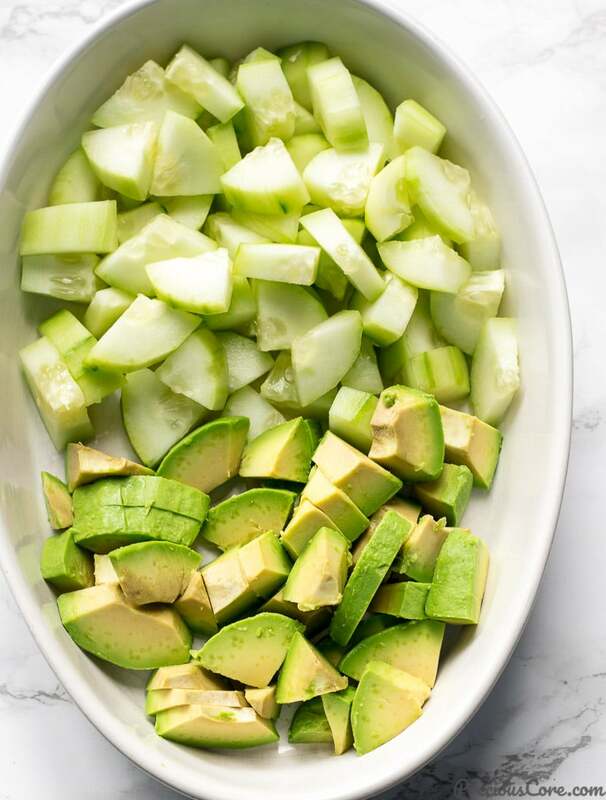 Once the cucumber and avocado are chopped and placed in the bowl, you drizzle the dressing on top. Perhaps the mayonnaise dressing is my most favorite part of this recipe. You only need mayo, freshly squeezed lime juice and some honey. Mix them all together and what you get is a creamy, slightly tangy, slightly sweet, to-die-for mayonnaise dressing. Drizzle the dressing over the Cucumber Avocado Salad and weep for joy. Then toss to combine all the ingredients and serve. 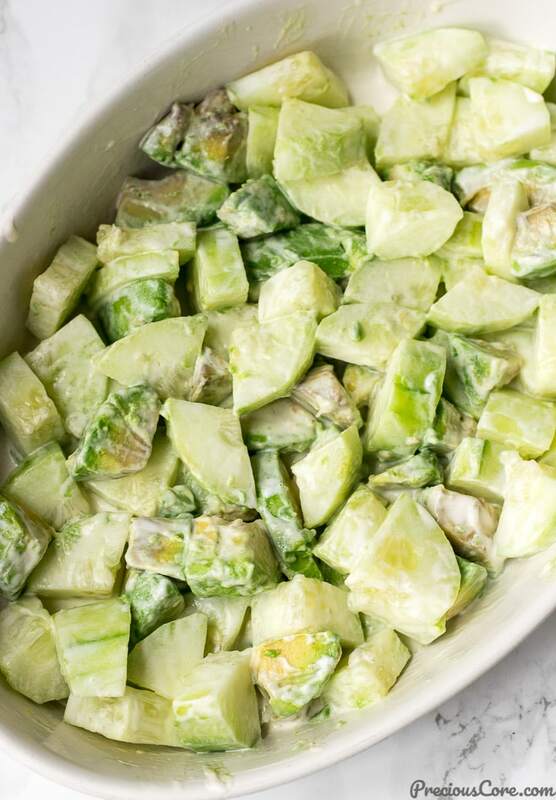 To make this Cucumber Avocado Salad even better, place in the fridge for about an hour before serving. 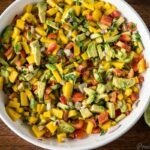 It’s so simple just like my Cucumber Mango Salad yet so delicious. 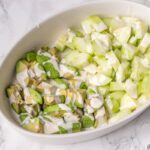 This Cucumber Avocado Salad is fresh, crunchy, creamy, tangy, slightly sweet and a pure delight in my mouth! The crunchiness of the cucumber and the creaminess of the avocado is such an epic combo! Try this simple salad, guys. Sometimes simple is the best. 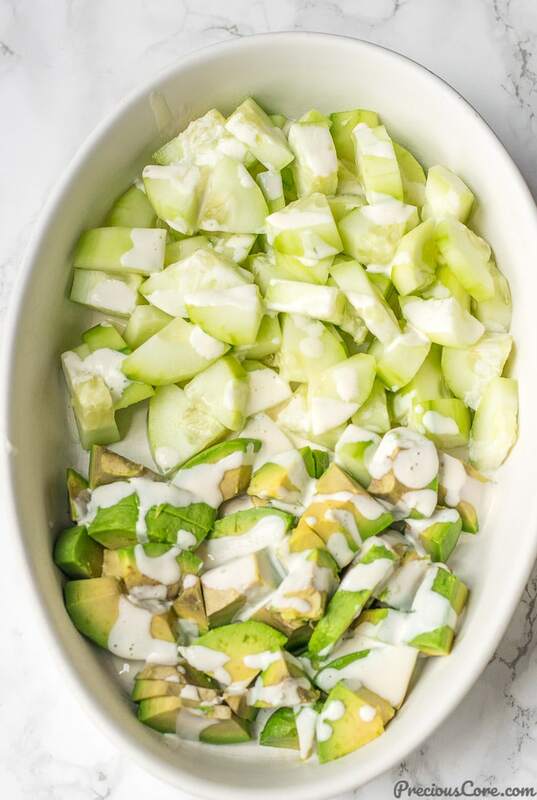 This Cucumber Avocado Salad is fresh, crunchy, creamy, slightly tangy, slightly sweet and the best part is it is so easy to make! Peel cucumber and chop into about 1-inch slices. Peel avocado and also cut into 1-inch slices. Place the chopped ingredients in a bowl. Mix together all the ingredients for the dressing and drizzle on top. Toss and serve. To make it taste even better, chill for 1 hour before serving. 1. 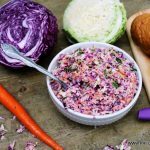 I like keeping this salad simple but you could add about a tablespoon of chopped red onion if you wish. You could also add green leafy vegetables (like lettuce, spinach or kale) to it and serve. 2. Adjust the dressing according to your taste. If you like it sweeter, add more honey/sugar. If you like it tangier, add more lime juice. You can… if only you believe. Simplest recipe so far. Will definitely try it. this looks so appertizing, especially on the days we dont feel like cooking or making something complicated. Thanks for this. Yes, sometimes simple is the best! 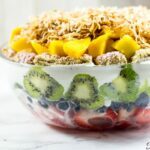 I’m always on the look out for simple recipes and I’ll definitely try this out soonest. Thanks for sharing and have a great weekend ahead!